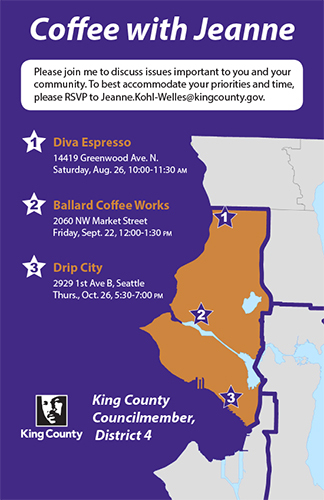 King County Councilmember Jeanne Kohl-Welles will hold a series of coffees to discuss issues important Council District 4 which includes Fremont. These include affordable housing, homelessness, transit access, heath and equity and more. Closest to Fremont is the Ballard Coffee at Coffee Works, 2600 NW Market St, Friday, Sept. 22, 12:—1:30 pm. Coffee with Jeanne at Coffee Works, 2600 NW Market St, Friday, Sept. 22, 12:—1:30 pm.